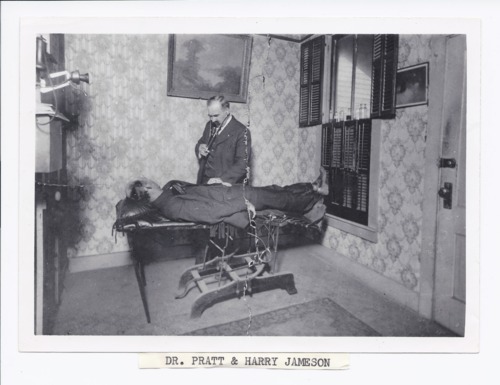 Dr. Henry Fuller Pratt treats patient Harry Jamieson in Rossville, Kansas. Dr. Pratt was born in Kossuth, Ohio, December 8, 1861. He moved to Topeka, Kansas, when he was four. He married Jennie DeVinney in 1888. He practiced medicine in Rossville, Kansas, from 1885-1887 and 1895-1919. He served as the first president of the Peoples State Bank from 1909-1919 and was a member of several organizations. This picture was taken December 22, 1960. This photograph is provided through a pilot project to host unique cultural heritage materials from local libraries on Kansas Memory and was accomplished by mutual agreement between the Northeast Kansas Library System, the Rossville Community Library, and the Kansas Historical Society.